This post is sort of non-biking related. Found an interesting article on the Hoot, Toot, & Whistle that has some good pictures in it, too. 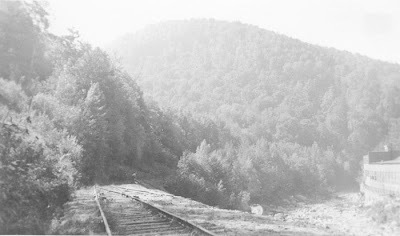 I rode the railroad bed, what is now called the Harriman Trail, last summer while vacationing in Vermont and had a blast, I think because it comprised of riding into a piece of history that I find extremely interesting as well as mountain bike riding itself. I hope to get back there next year to ride the trails from the former Mountain Mills area up to the Sommerset Reservoir, which are old Narrow Gauge beds that were used for logging. Don't remember where I found this picture but I thought I would throw it on as an addendum to this post. I think this shot is of one of the factories that the HT&WR serviced. If you look closer, there is a dismantled siding and there is a guy doing something further back.